Rich nourishment, without hair feeling weighed down. With Botanic Oils & Collagen. It leaves hair touchably softer. With macadamia oil, the formula transforms dry hair. Rebalances biological changes giving a radiant shine. How to have shiny hair? Apply to the mid lengths of your hair and ends of wet hair and rinse. For best results use with the full Dove Shine Revived range. We ask what makes hair shiny? How to get shiny hair? Continuously we are looking for an answer to how to treat frizzy hair. There are suggestions such as using Macadamia Oil. However, then you wonder how to use Macadamia Oil for hair? With Dove we have the solution for you, no longer do you have to worry about what to do with dry hair. Meaning we can all keep on enjoying healthy hair with Dove Advanced Hair Series Shine Revived conditioner, moisturising dry hair! Our Dove Advanced Hair Series Shine Revived conditioner gives rich nourishment to help rebalance biological changes of dry hair, it is your dry hair remedy. Did you know? As hair goes through changes over time, it becomes more frizzy and drier. Meaning you need a frizzy hair treatment. 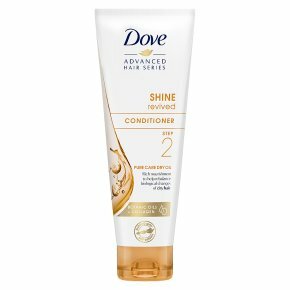 Dove?s Shine Revived conditioner, has a luxurious formula with a blend of Botanic Oils, Collagen and Macadamia Oil, leaving your hair silkier and shinier*. It is the answer to how to make hair soft and shiny. Giving rich nourishment, without weighing your hair down . With Botanic Oils & Collagen. It leaves hair feeling softer, allowing you to no longer have to worry about how to get soft silky hair. Our formula transforms dry hair, with the use of macadamia oil. Helping to rebalance biological changes. How to have shiny hair? Apply to the mid lengths of your hair and ends of wet hair and rinse. Can be used daily. For best results use with the full Dove Shine Revived range. *Shampoo+conditioner+oil vs. non-conditioning shampoo.